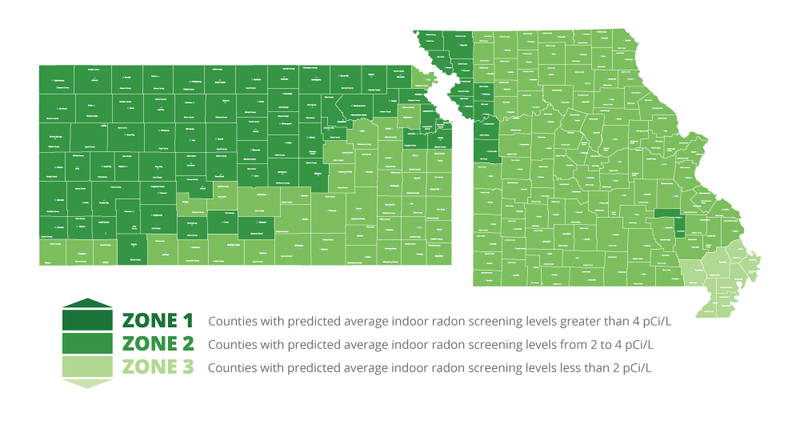 1 in 3 homes in KC have high radon levels. Since 2008, Certified Radon has been Kansas City’s premier provider of radon testing and radon mitigation solutions. Thousands of homeowners, commercial property managers, and real estate professionals trust Certified Radon for accurate radon measurement and affordable radon removal. We serve residential and commercial customers across the Kansas City Metro, from Overland Park, Olathe, Leawood, Shawnee and Kansas City, Kansas to Lee’s Summit, Independence, Blue Springs, Liberty, St. Joseph, and surrounding areas. See our team in action. Radon is a radioactive gas that can cause cancer. Because radon gas has no smell, is invisible to the naked eye and has no taste, it is considered one of the most deadly forms of gas. Radon is radioactive. Outdoors, there is little danger because radon is diluted in the open air. But indoors, radon is trapped and becomes concentrated in enclosed or poorly ventilated spaces. All homes have some amount of radon. The question is how much. Since you cannot taste, smell or see radon gas, scientific testing is needed for detection. From Overland Park to Odessa, Leawood to Liberty, South KC to St. Joseph, we are Kansas City's Certified Radon Professionals. We’ve built our company on facts, not fear. Certified Radon has grown to become the premier provider of radon testing and mitigation services in Kansas City because of our commitment to safety, service, and professionalism.